The information for this blog can be read here. Reminder: COLA authorizes the bottling of wine, distilled spirits, and malt beverages. What if you have a wedding or a special event coming up and want to include a commemorative date or someone’s initials or name on the alcohol bottle? Believe or not special rules apply. 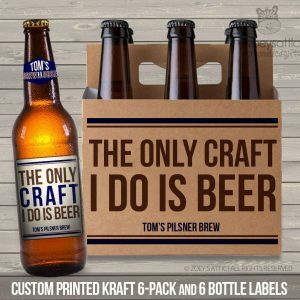 Personalized labels are customized for customers who want to have a special label on the alcohol container. Special labels include a personal message, picture, date, or artwork that is specific to the customer who is purchasing the product. *Personalized labels are DIFFERENT than customized private labels. Private labels are specific to the purchaser (a retail store or restaurant that is selling the alcohol to consumers). Applicants must indicate that you plan to have a personalized label on the COLA application. If the label is etched, the information will be etched on the bottle. *Just because you are allowed to make personalized changes on the label does not mean that it is legal for you to add new information to the label. You cannot change the alcohol beverage or characteristics of the alcohol beverage. Basically, any mandatory label information, such as the brand name or class, cannot be changed or altered in a personalized label. What can not appear on a personalized label? Personalized labels are subject to the same rules and regulations as non-personalized labels. Labels cannot contain false or misleading information, misleading health claims, etc. If you have any questions please do not hesitate to email me at john@beerlawcenter.com or john@mathesonlawoffice.com or call 919-335-5291. Be sure to check out Beer Law Center and Matheson Law Office for all things NC legal.